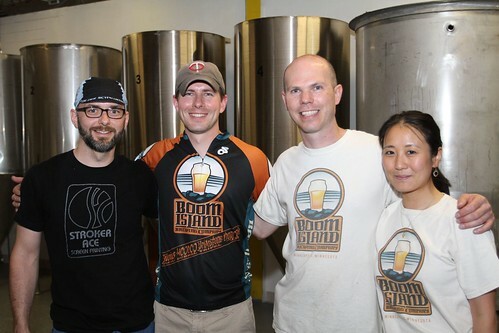 Stopped by Boom Island Brewery last night, as it was the first time Kevin and Qiuxia let visitors in, corresponding to the release of their Brimstone Tripel. I've been looking forward to taking a peek inside the brewery since they opened a few months ago, especially after meeting the team at homebrew day several weeks ago at the Lyndale Ave. Northern Brewer, where Kevin gave a talk on Belgian beers while we sampled Boom Island's available releases. Boom Island is a simple setup with four conical fermenters and four Belgian-style beers offered. I'm not quite sure how they manage the scheduling as the ratio of ageing vessels to beer styles seems low, but they were busy and I was already taking enough of their time from the other patrons to continue asking questions. Not to mention I was anxious to get out of there to taste one of the two 75cl bottle conditioned Brimstone's I picked up. Having made several trips to Belgium myself, even bicycle touring through Orval, Chimay, and Rochefort, I have a strong respect for what Kevin is doing with his Belgium yeasts. While I do enjoy some of the hop bombs offered by many of the breweries right now, it's nice to sit back and enjoy a more subtle offering without pushing towards or past the three-digits of IBU's that is trending across this country. Boom Island's Brimstone, while a tripel, is welcomely one of the lighter tasting ones I've had, gladly lacking the common alcohol bite on the taste buds, though still coming in at just under 10% alcohol by volume. I'm looking forward to seeing Boom Island grow in the near future, hoping to see a few more conical fermenters on my next visit. Seeing the operation certainly adds fuel to my desire to do something similar in the future, open a small neighborhood brewery to serve tasty local beer to the community, but for the time being I'll just keep on enjoying it myself. Thanks to Emily for snapping this shot of myself, Jeff, Kevin, and Qiuxia. Boom Island article at StarTribune. I spent a minute talking to brewer Jeff about their conical fermenters and how I was researching building my own, he directed me towards Stout Tanks and Kettles in Portland, Oregon, you know, that other bicycling city. It looks like they're currently out of stock on a few of the sizes I'd be interested in, but they're quite a bit less money than the Blichmann line, especially considering Stout builds with tri-fittings as standard equipment. While the conical fermenter is a bit of an expense for the average home brewer, I think it pays for itself in time saved: going from primary to secondary only takes a few seconds compared to an hour or more racking from carboy to carboy, once you factor in cleaning and sanitation times. you need some of that stout equipment!